If we are going to chart the development of the PC, it’s core architecture and the technologies that make a PC, a PC; then you can’t but help chart the history and development of the Intel Corporation’s microprocessor chips. Intel is the dominating force in the consumer and enterprise computer market make no mistake. If Intel sneezes your PC catches a cold. From Apple computers to enthusiast constructed PC’s, from tablets to smartphones from Telephones to Internet switching Intel chips and products are almost as pervasive as air. Certainly the products they manufacture make modern life possible. The Intel 8088 (pictured above) was Intel’s seminal product. The chip that changed the world by introducing the planet to affordable computing devices for business and even the home user. As simple as the 8088 is by modern standards it too has its history and this history is the development of rudimentary electronics manufactured by a start-up that would in turn lead the world in consumer electronics. The PC (much like Intel) has extremely humble beginnings; the company that was founded by Gordon E. Moore (the same Moore responsible for Moore’s law) a chemist and (unsurprisingly) a physicist as well. Other founding members included Robert Noyce ( another physicist and also the co-inventor of the integrated circuit), Arthur Rock (an investor and venture capitalist) and Max Palevsky. The company was essentially founded by Moore and Noyce who originally wanted to name the company “Moore Noyce” however phonetically speaking Moore Noyce is rather too close to “more noise” which is a rather ill-suited name for an electronics company since Electromagnetic noise generated by circuitry is hardly welcome in any circuit design and is associated with electrical interference. Eventually they would originally name the company NM Electronics for just under a year before settling on Integrated Electronics or “Intel” for short. However this was not without issue as the name “Intel” was already trademarked by hotel chain n the United States, as a result the fledgling company had to buy the rights to the name. In its earliest days Intel had a reputation that was won of the back of its ability to produce semi-conductors. This is indeed highlighted by its initial product the 3101 BiPolar SRAM module that was twice the speed of earlier implementations produced by Fairchild and the Electrotechnical Laboratory in Tsukuba, Japan. In the same year (1969) Intel also produced the 3301, a 1024 bit ROM (Read Only Memory) module alongside its first Metal Oxide Semi-Conductor Field-Effect Transistor (MOSFET) SRAM chip, the 256Bit 1101. But it wasn’t until 1971 that Intel produced a product that would revolutionise the world. One of the earliest examples of a CPU. The Intel 4004 is a 4Bit CPU that was launched by Intel in 1971. The chip was originally designed for Busicom Corporation but in mid-November of the same year Intel made the 4004 commercially available to the general market. 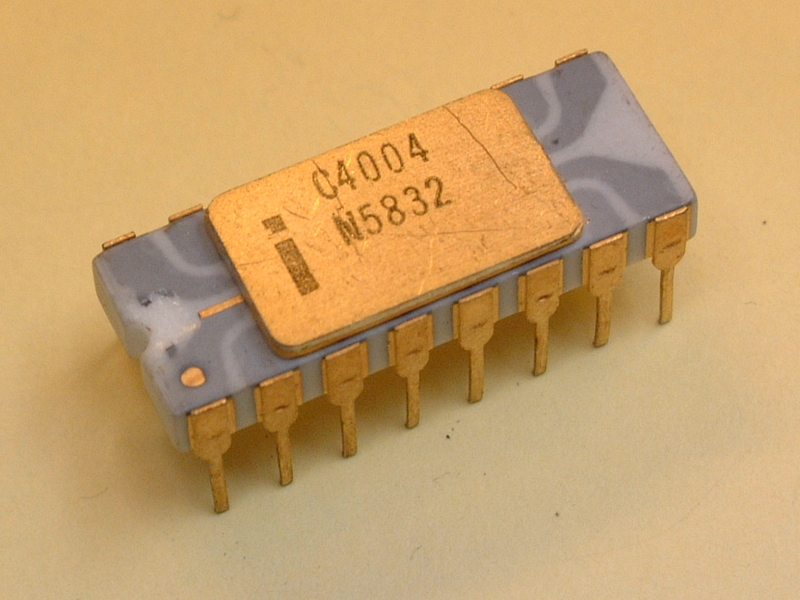 The 4004 was the first fully integrated CPU housed on one silicon chip. By 1972 Intel had entered the Microcomputer market launching the 4001 ROM, 4002 RAM and 4003 Shift Register chips alongside the 4004. With these components, Microcomputers with varying amounts of memory and I/O facilities could be built. Despite the primitive nature of early PC computers, the success enjoyed in the marketplace convinced Then-CEO Andrew Grove to re-focus the company’s efforts to the development of Microprocessors and to change certain aspects of that business model. By the end of the 1980’s this decision had proven to be successful. 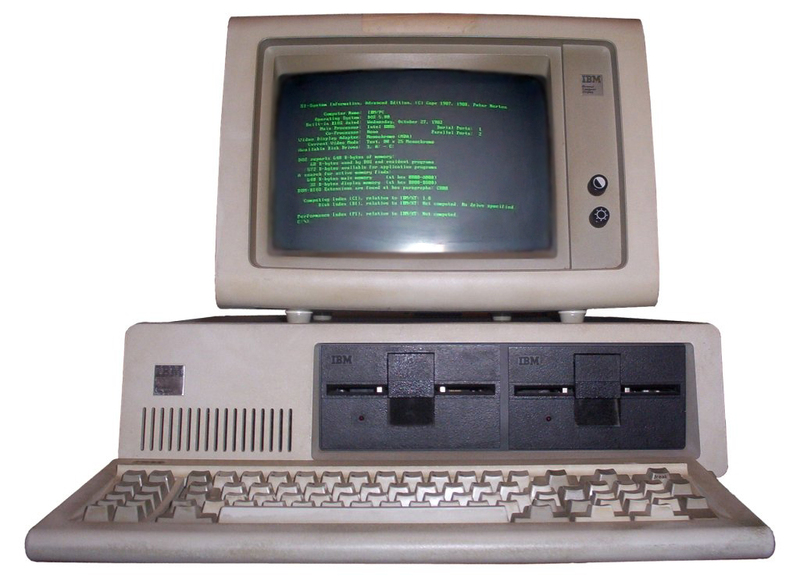 With thanks to its position as supplier of processors to IBM, and since IBM was the company that architect-ed the platform this made Intel the defacto standard for PC systems; Intel embarked on 10 year period of unprecedented growth as the primary and most profitable component supplier to the PC industry. This was a position it sought to solidify in 1989 when it launched the Intel Inside marketing campaign. This campaign allowed Intel to capitalise on it’s position and establish brand and consumer loyalty, to such an extent that by the end of the 1990’s it’s line of Pentium CPU’s were a household name. However, by the early 2000’s international demand for high-end microprocessors slowed. Competitors like AMD had garnered significant market share. This was in part attributable to Intel becoming complacent with its position in the market space and in part due to a side-effect of that complacency. Intel simply stopped developing it’s product range. PC development stagnated, permitting Intel’s competition to catch it off-guard. Intel also had become embroiled in litigation for a number of years as a result of US patent law not recognising Intellectual Patent rights on microprocessor designs. In 2005 Intel’s CEO Paul Otellini reorganised the company to refocus it on core CPU, platform and chipset businesses. With specific focus on 4 distinct marketplaces, the enterprise, Home, Health and Mobility. In 2007 Intel then unveiled its ‘Core’ architecture products to global critical acclaim. The Core range of chips were perceived as an exceptional leap in computational performance for the commercial market which have in turn led to Intel recapturing the market as THE provider of leading edge consumer electronics. Since the introduction of the Core architecture Intel has refined the technology further by shrinking the Microprocessor Die size to 45nm and with recent innovations, even 22nm. This permits Intel to incorporate more transistors on its processors but also to operate these chips at higher frequencies with reduced power consumption. However Intel is only one part of the equation as such there remain two more essential players in this story, namely AMD (Intel’s largest competitor) and of course the development of the Processor’s themselves.